Absalom’s Hair, or, Give Me a Head With Hair! 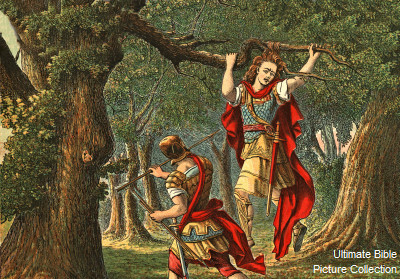 Although the biblical text says that Absalom caught his head in the tree, it is probably a reference to Absalom’s hair. Did you know that in the ancient Near East long hair was frequently a picture of a warrior’s prowess and strength? The most obvious example from the Bible is Samson whose long hair is explicitly connected with his strength (Judges 16:17). Samson’s long hair symbolized his separation to God (the true source of his strength––Judges 13:5) and when his hair disappeared, so did the Lord’s presence (Judges 16:20). But Samson is not the only long-haired warrior mentioned in Scripture. In fact, the man I have in mind is very Samson-like in some respects. He is spoiled, likes to burn other people’s fields (Judges 15:4-5; 2 Sam. 14:30), and is well-known for his long luxuriant hair (2 Sam. 14:26). His name is Absalom, one of David’s sons. Absalom had so much hair that when he cut it each year it was said to weigh between 4-5 pounds! (2 Sam. 14:26). We are familiar with Samson’s connection to hair, but why does the biblical author draw so much attention to Absalom’s hair? There are probably several reasons. The mention of Absalom’s hair prefaces the story of his rebellion against David. Since long hair was associated with strength, this could be considered an ominous sign, suggesting that Absalom will be successful in overthrowing his father. However, Absalom not only has a fertile head of hair, he is also quite fertile in other ways, having fathered 3 sons and 1 daughter (14:27). Earlier in the story, David’s potency as a father is also connected with the strength of his rule (see 2 Sam. 3:1-5). Therefore, the long-haired, and virile Absalom appears to pose a real threat to the kingdom of David. Add to this his good-looks and charming ways (2 Sam. 14:25; 15:2-6), and Absalom appears to be a winning candidate for the kingship. This is often the basis for choosing today’s politicians. If they look good, and have the ability to schmooze the people, then they are surely the right person for the job! Absalom’s story is just one of many recounted in 1&2 Samuel that teaches us “looks can be deceiving.” In reality, Absalom is none of the things he appears to be. His desire to destroy his father tarnishes his good-looking image. In fact, Absalom’s hair conspires with the branches of a tree to do him in (2 Sam. 18:9-10–the text reads “head” which in this case is another way of speaking of his hair). Far from being a strong warrior, Absalom proves to be quite inept. Even Absalom’s potency as a father is challenged at his death when we are told that he set up a monument for himself because he had no son (2 Sam. 18:18). Wait a minute! I thought Absalom had 3 sons? 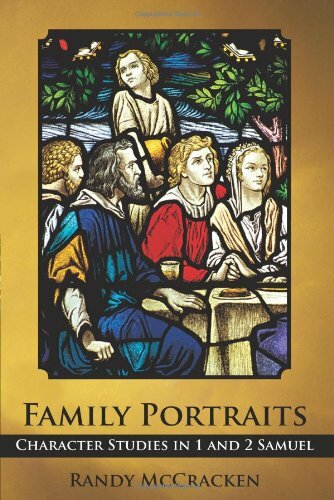 I will offer an explanation of this apparent contradiction in my next article, or, for a full treatment of this problem you can read the chapter on Absalom in my book Family Portraits (especially pages 364-365 and 379-380). Meanwhile, we should take the Bible’s advice seriously and not believe everything we see. Patience and discernment are important ingredients of wisdom, and time is a great revealer of the truth! Important or Impotent: How Many Sons Did Absalom Have? Is King David A New Adam? Previous PostEnvy and the Cross (Mark 15:10)Next PostImportant or Impotent: How Many Sons Did Absalom Have? That was an awesome explanation. Randy, you are a very gifted student of the word. Thanks for your kind words Nicholas. God bless!